Families have loved Alta for over six decades, since 1938. This skiers’ only mountain has terrain for everyone from tykes to backcountry junkies that want to hike from their turns. Just one thing, snowboarders are not allowed, never have been. Recent lawsuits by snowboarders were unsuccessful, trying to gain access to Alta’s US Forest land, judges deemed the ski resort can make their own access rules as a private company. Serious skiers say if you can ski Alta, you can ski anywhere. 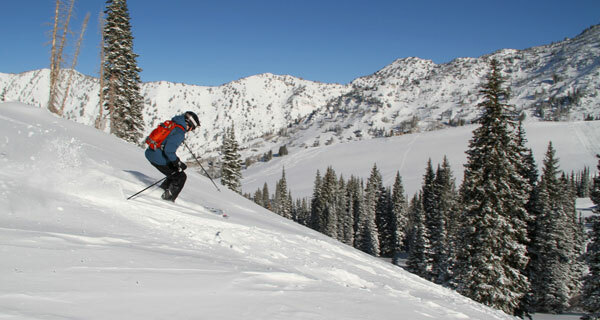 Alta offers amazing terrain, some steep and crazy, some well groomed with gorgeous views of the Wasatch range. 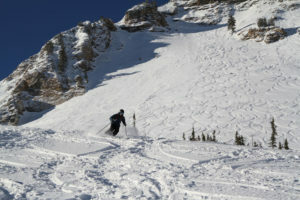 Alta covers 2,200 acres typically coated in fluffy light dry Utah snow. Alta’s terrain varies from steep avalanche chutes and wide open powder bowls like Ballroom and Greely’s on the flanks of 11,068′ Mount Baldy. But there are plenty of groomed cruisers off the Sugarloaf and Collins quad chairlifts. Alta has 116 named runs, and a recently upgraded lift system with three detachable chairs. Young families will love the Sunnyside lift and the Albion Base Lodge where all learn to ski programs are centralized including Alta’s Children’s Adventure Center and Alta’s day care. While the kids are at ski camp, ski High Rustler then reward yourself with a delicious mid-mountain lunch at Collin’s Grill. 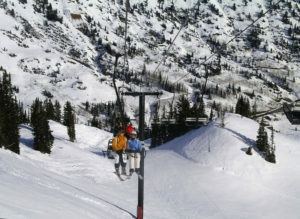 Alta and Snowbird offer an interconnected lift ticket, called the One Ticket, so you can ski all 4,700-acres in a day. For lodging, the finest on mountain hotel is The Rustler Lodge at Alta, with 85 rooms from dorm style rooms to deluxe suites with a mountain view. Your kids will love the outdoor heated pool, and parents will love the spa and the meal plan that’s included in your package so breakfast and dinner are done in style, with a view of Alta’s ski slopes. For more authentic old school Alta, the Alta Lodge is another great lodging choice, more humble and historic, close to the lifts with a fantastic après ski Sitzmark lounge that serves up good times and grand stories of Alta’s past. A proposed Wasatch One to interconnect seven Utah ski resorts, Deer Valley to Park City, The Canyons, Snowbird and Alta, Solitude to Brighton has been in the works for a decade, but with Deer Valley and Alta both banning snowboarders, and environmentalist blocking lift and trail development to Utah’s mountains, it may or may not ever happen. The Utah Interlink would bring European style skiing from village to village to the US in an unprecedented pass. 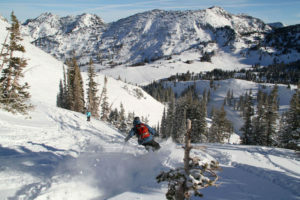 Currently Ski Utah offers a backcountry Interconnect tour of the seven ski areas for advanced skiers only with AT or telemark gear recommended to ski the 25 mile guided off-piste tour.